Early symptoms of xylitol poisoning include vomiting, coordination problems, and lethargy. The sweetener causes a drop in dogs’ blood sugar levels and can even cause liver failure. 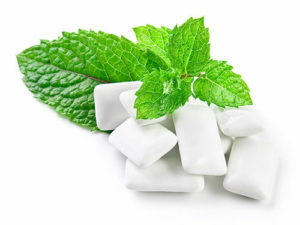 Besides chewing gum, xylitol is often found in candies, toothpaste, diet foods, and even peanut butter. The latter is particularly dangerous since many dog owners give their dogs peanut butter and it isn’t a product where you expect artificial sweeteners. Xylitol exists naturally in some fruits and vegetables, but that’s in such small amounts that it isn’t a threat.